You’ve just won the lottery and someone asks you to do a happy dance for the cameras. Who would refuse? Here’s a selection of delightful Canada Lotto 649 would-be winners who were only too pleased to show their moves in public. Except one. When Gregorio De Santis (center) was about to donate his old clothes to charity recently, he never thought that a simple suggestion would make him a millionaire. When It's Draw Time, Do You Know Where Your Lottery Tickets Are? The man reached into his pocket to grab his million dollar ticket. Staff at the Oklahoma state lottery looked on expectantly as he patted his pockets frantically. His wife looked mortified as they both realized he had lost his winning ticket - and the million dollar check he had come to collect. What Is The Easiest Lottery Game In The World To Win? Hoosier Lottery winners Larry and Connie Miller show that big jackpots can come from small state lottery games. Most people are playing the wrong lottery game and don't know it. This family of eight won Saturday's $12 million jackpot in Canada's 649 lottery. What do you do when you're a large family, and you all want to go collect a lottery prize together? You order a stretch limosine and travel there in style. That's what a family of eight from Roseneath, 50 kilometres southeast of Peterborough, Ontario, did to claim their $12,371,981.20 prize. June Devellano of Fenwick shows her $100,000 Canada Lotto 649 check. June Devellano of Fenwick was all smiles after winning $100,000 in Canada's November 28 Lotto 649 draw. The eleven winners of a $9 million Canada 649 jackpot show their check. For these eleven Canada Post workers, it's business as usual. Even though each of them received almost $823,000 each, they plan to stay at their jobs. 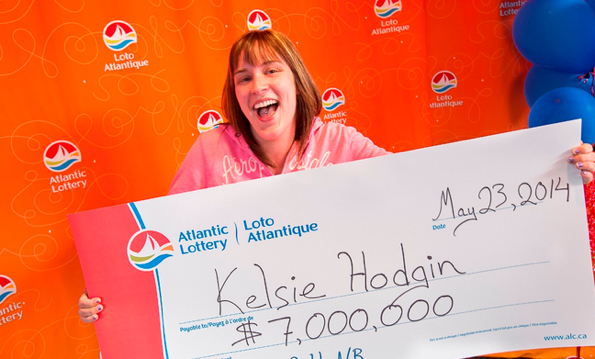 The shock of winning Canada's Lotto 649 jackpot of $7 million didn't worry 19-year-old Kelsie Hodgin from Southfield, NB, but some online gaming playing has others worried. Three Lotto 649 lottery tickets bought at the store normally costs $3. But Peggy Staruch got a surprise when she bought them online from PlayOLG and checked her credit card statement.